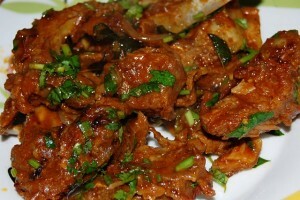 Dilpasand Mutton (Bhuna Gosht) recipe by Soniya A Khan at DesiRecipes.com. Remove with a slotted spoon and grind them together with the cardamoms, cloves, nutmeg and mace. Reheat the oil, put the cinnamon , ginger / garlic , mutton pieces and salt . Fry till the meat is light brown. Mix the ground onion mixture with the yoghurt, red chilli powder and coriander powder.